Consumer electronics giant LG is all set to unveil a wearable fitness device/band, according to a recently published tweet. Famous Twitter sensation @evleaks posted a tweet claiming that LG is preparing to unveil a fitness band that will be similar to Nike FuelBand; rather than to a smartwatch like the Galaxy Gear. In August 2013, a senior LG executive had said that the company could introduce a branded smartwatch sometime in the near future. 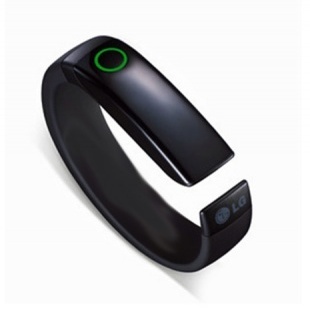 Christened as the LG LifeBand Touch, bears quite close similarity to LG's smart activity tracker. According to leaked details, the wrist band will be capable of transferring calls, notifications as well as messages directly to their phone. It will also have an in-built GPS. The new device will also feature a circular ring - the dial that will allow users to monitor the heart beat. Last week, a report suggested that LG would introduce not one but two devices, dubbed G-Arch and G-Health, both of which are concerned with health and fitness. Experts believe that LG's fitness band could be unveiled during the CES 2014, which is scheduled to take place from January 7 through January 10 in Las Vegas. The South Korean manufacturer is also expected to launch a smartwatch alongside the launch of the G3 smartphone at Mobile World Congress in Barcelona in February. The year of 2014 will be all about wearables computing devices. While Samsung has already launched its Galaxy Gear smartwatch, Apple's iWatch is expected to hit the market in the next few months.